This collective identity belongs to no one in particular, but is at the disposal of anyone who knows its rules and knows how to apply them. Anonymous, the collective identity, is older than Anonymous, the hacktvist group – more to the point, I propose that the hacktivist group can be understood as an application of Anonymous, the collective identity. This identity originated on imageboard 4chan.org, as a byproduct of a user interface policy called forced anonymity, also known for short as “forced anon”. Forced anon made it impossible for users to type in their name when they published a forum post. Instead, “Anonymous” would invariably appear as the default author name for any post. As a result, and in particular for the uninitiated, discussions on 4chan would seem like an absurd soliloquy, with “Anonymous” posting a message and “Anonymous” and “Anonymous” responding. What this interface policy prevented was the creation of a hierarchy among users, which is known to quickly establish itself in online forums, with older forum members dominating and “newbies” having little weight in the discussion. Anonymous’s (the group’s) present dismissal of hierarchies and leadership has its roots in this practice. The uncertainty about who is talking (or probably just talking to him or herself, feigning conversation) is characteristic of the “forced anon” experience. Herwig’s piece is in part a response to the recent schism within Anonymous; within any “normal” hierarchical group, such a schism would probably spell its imminent demise, but I suspect the very nature of Anonymous will ensure its survival, even if it mutates and undergoes a sort of metastasis. The choice of the V For Vendetta masks as part of their iconography is quite telling; the point Moore was making in the book about emergent resistance to hierarchy and fascistic control is echoed in the unpredictability of their target choices. Dissent cannot be bridled or steered; that is its power, and its self-limiting principle. To unpack that last statement: self-identifying as a member of Anonymous is a lot like self-identifying as an anarchist, in that anyone can slip on the mask at any time, and the non-hierarchical nature of the collective means that there is no authority with the power to deny your validity. This has its downsides, in that it makes for easy pillorying and demonisation of the collective identity (such as the way that a few self-identifying anarchists bricking windows on protest marches are conveniently assumed to be representative of all anarchists), allowing a convenient way to obscure the genuine problems of hierarchy by focussing on the more foolhardy and socially unacceptable attacks made upon it. But there are upsides, too, in that the more nihilistic wearers-of-the-badge tend to perform acts that are self-limiting in the long term; because the collective is headless, it cannot be destroyed, so the hierarchical world has to content itself with the sort of decapitations that symbolically represent the defeat of a system or group in their own narrative, while all they’re doing is trimming the wilder edge-growths of the rhizome and preventing it from becoming a hierarchy itself. All of which is to say that I think Anonymous – and anarchism-as-philosophy – aren’t going anywhere soon; in fact, I’m beginning to think they’re an inevitable product of a global networked culture, a counterweight to the structure of society that increases in mass in proportion to the rigidity of the systems it opposes. Neither are an end-point or a goal; those that join in the hope that they are will soon leave, disappointed, because the individual reward they subconsciously seek for their actions are incompatible with the anonymity under which they are obliged to operate. Austin gives the example of an orchestra. If I want to be free to play the violin in a well-performed Beethoven symphony, then I must submit myself to the authority of a conductor, for without the conductor the other musicians cannot be brought into coordination with my playing. Submission to authority for the sake of freedom is not, as Simon recognized, a function of human sin but instead finitude. It’s not the case that an orchestra can just play if everybody is selfless and cooperative. Someone needs to guide the whole so that each player can concentrate on his or her part. Nobody can both play the violin and at the same time and conduct the orchestra. The logic there is sound enough, but it’s built on the assumption that everyone wants to play through the precisely denoted structure of that Beethoven symphony, and the implication that anything else would be a cacophony of unpalatable noise, or at the very least inherently inferior to Beethoven. Well, look: I spent three hours last night jamming with a handful of other musicians. We don’t play from sheet music; the band doesn’t “belong” to anyone; there is no conductor or leader. We take the simple rules of harmony and melody, and we start playing; music emerges. Sometimes it takes a little while to find a groove; sometimes there are bum notes, fumbled phrases, rhythmic slips. But sometimes we come up with stuff that transcends our individual abilities – little passages which, when we’ve finished playing, we discuss with a mixture of surprise and awe. There was no planning, no leadership, but we still created something amazing. Part of that comes from the selflessness that our theologian friend above claims is insufficient, but another part comes from the selfishness of occasionally feeling that one knows what the moment demands, and the willingness to step out of the groove and extend it upwards, outwards, inwards, wherever. The orchestral analogy’s appeal to a theologian is pretty obvious: the orchestra first has to recieve the text of the piece, a rule-set handed down to them by a distant authority figure whom they can only hope to partially channel and glorify; the text then has to be interpreted by the conductor, who plays no part in the creation of the symphony beyond grafting a personal vision and interpretation to the text. The musician’s place is to play what he is told, just as the communicant’s place is to accept, without question, the interpretation of God’s word as filtered through his priest. The expansion of political responsibility beyond a certain point would absorb our private lives, a result that entails the opposite of what most people intend when they endorse political liberty. Like the violinist who can’t concentrate on his part and conduct at the same time, finite human beings don’t have enough energy to attend to the ordinary duties of life and bring about world revolution. It would be oppressive in the extreme if all of us were vested with exactly the same responsibility for the common good. Regular readers can probably see the sociopolitical direction in which I’m driving, so I’ll stop before I belabour it too badly… but not before pointing out that when an orchestra finishes playing, it is the conductor who takes the bow, and takes the glory that the musicians have laboured for. The authors are not consciously political radicals, but they are clearly inspired by the possibilities of autonomy that have been opened up in the 21st century. I would guess that not a one of them has read Bakunin, Rolling Thunder, or anarchistnews.org; they’ve struck upon the idea of mutual aid economics and horizontal structuring largely in a vacuum. To be honest, I think there’s an element of the vanity of the marginalised at play, there. Sure, Scalzi et al may not have read the sources Killjoy cites, but they’re hardly the only places that anarchist ideas crop up; anyone who reads Futurismic would have stumbled across the ideas of mutual aid economics and horizontal structuring, and – my personal politics aside – I don’t think anyone would claim this website as an explicitly anarchist text*. The ideas Killjoy is highlighting have been part of science fiction’s stock in trade for some time… that’s exactly where I discovered most of them, at any rate. I’m surprised at her surprise, in other words; sf is hardly the vacuum of ararchist ideas she seems to think it is. However, once we get past Killjoy’s own outsider theatrics, she has some interesting readings to share, and raises an interesting point: that certain components of the traditional anarchist philosophical platform are indeed becoming more culturally acceptable (provided you define inclusion in science fiction stories as a badge of cultural acceptance, which I suspect would be contested vigorously by a large section of the populace), or at least acceptable enough to be put forward as plausible solutions to a difficult near-future in a fictional context. Radicals might also be fools for not realising that sf has had a fair few fellow-travellers for many years, too… but the underlying point is valid. Critiques of intellectual property, top-down power structures and the machinery of democracy are indeed rampant in modern culture, especially online, and especially in the sphere of science fiction. Whether that means sf is a vanguard for coming political change or merely a haven for otherwise unacceptable and marginal radical ideas (or perhaps both) remains to be seen. Last time we mentioned Detroit here, it was in the less-than-cheerful terms of it becoming a growth region for private security patrols, and the web is full of similar stories charting the Motor City’s decline in lucid hand-wringing detail. But what if they’re ignoring the positives in favour of those apocalyptic headlines and photos? Aaron M Renn at New Geography makes the point that the city’s administration seems unwilling to face up to the extent of the problem, but also highlights the pioneering atmosphere that Detroit’s “urban prairie” is nurturing. The withering of local government leaves spaces of opportunity for innovative approaches to low-budget living to take root… and while the living ain’t easy, the make-do attitude of the American pioneer spirit seems to be making a return [via Warren Ellis]. In most cities, municipal government can’t stop drug dealing and violence, but it can keep people with creative ideas out. Not in Detroit. In Detroit, if you want to do something, you just go do it. Maybe someone will eventually get around to shutting you down, or maybe not. It’s a sort of anarchy in a good way as well as a bad one. Perhaps that overstates the case. You can’t do anything, but it is certainly easier to make things happen there than in most places because the hand of government weighs less heavily. What’s more, the fact that government is so weak has provoked some amazing reactions from the people who live there. In Chicago, every day there is some protest at City Hall by a group from some area of the city demanding something. Not in Detroit. The people in Detroit know that they are on their own, and if they want something done they have to do it themselves. Nobody from the city is coming to help them. And they’ve found some very creative ways to deal with the challenges that result. 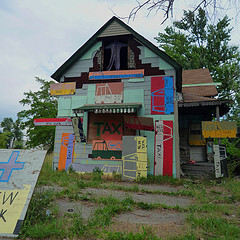 Imagine for a moment that this trend continues – might Detroit become some sort of independent city-state, a mildly anarchic rough-and-ready town where the price of freedom is a willingness to work hard for yourself and with your neighbours? How many more cities in the Western world might go the same way as manufacturing becomes increasingly outsourced overseas and/or roboticised? How will national governments react to these places – will they abandon them to the whims of their new residents, or struggle to control them in the face of diminishing tax revenues and the spiralling costs of law enforcement? I’m not naive enough to imagine Detroit becoming some sort of hippie utopia, but I think it has the potential to become a new type of post-industrial city – but that will depend on a lot of different factors. Should the government be involving itself more closely in these early stages, or will a hands-off wait-and-see approach prove more effective?